Jährlich im Sommer veranstaltet unser Club ein Camp für Jugendliche aus allen Ländern Europas. Annually in the summer, our club organizes a camp for young people from all over Europe. Auch 2019 lädt unser Rotary Club Jugendliche im Alter von 15 bis 19 Jahren in das Sommercamp nach Paulsdorf an der Talsperre Malter bei Dresden ein. 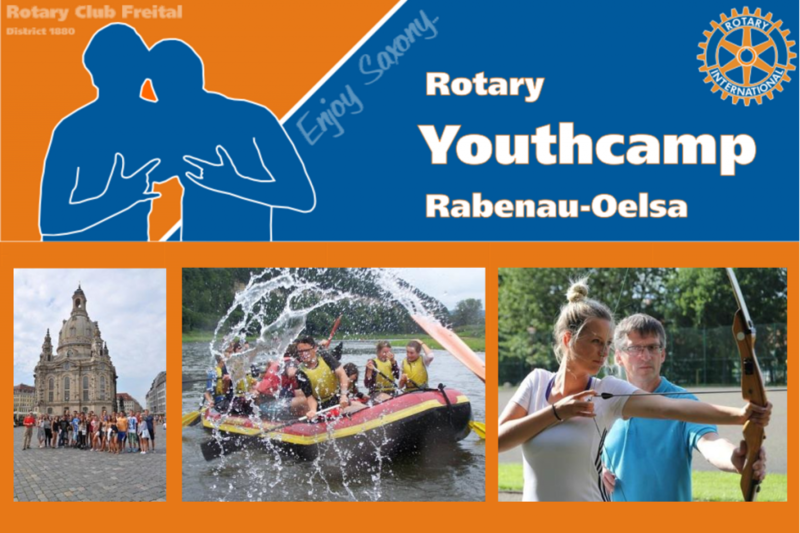 In 2019, our Rotary Club invites youths from 15 to 19 years to the summer camp to Paulsdorf at Lake Malter near Dresden. Thursday August 8th is the preferred departure day. recommending Rotary Clubs or districts. Two weeks later we have to get the AF´s of the candidate (if not, registration is cancelled automatically). The candidate gets confirmation of registration or decline of registration and the reasons for it . Four weeks after confirmed registration and demand of payment the fee about 200,- € has to be paid to our bank account (if not, registration is cancelled automatically). After receiving the fee the candidate gets confirmation of participation.